50 US States and 50 Countries before I turn age 50. That's it, that's the Quest. September starts as both the beginning and the tail end of my Quest. I hope to reach 50 States and 50 Countries by the age of 50, on November 23, 2017. Which means as of today I have just 9 states and 7 countries left to go to conquer my Quest ! to do it in ! Wisconsin, Mississippi, North & South Carolina, Indiana, Kentucky, Tennessee, West Virgina and Alaska. I have plans to make Alaska my last and to do a cruise with that one ! My future trip to far off places include : South East Asia. Do you think I can do it ? Let me know in the comments below. Any tips on how to get there ? Shoot me the info. I welcome any suggestions or fun ideas. 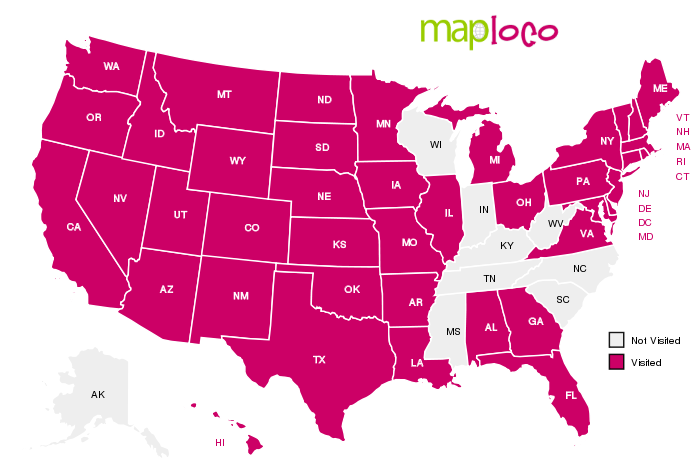 I have one question... How many US states are there, exactly ? As of September 9, I sit at 42 states and 43 countries. As of August 9, I sat at 35 states and 43 countries.